​Along with a series of craft workshops throughout the year, this exhibit will showcase a variety of traditional crafts. Topics will include: hair art, Norwegian fiber arts, beading, miniatures, wood burning, bookbinding, paper cutting, Potawatomi carved wooden spoons, Finnish bird carving, Ojibway quill art, and seed saving. Learn more about the crafts of our immigrant, Vicortian and Native American ancestors. It will include exquisite examples from the History Center's permanent collection, the workshop instructors and the community. Dan Truckey will speak about the folk traditions brought to our region by various ethnic groups. Research Librarian, Beth Gruber will present on genealogy sources available in our library. Light refreshments will be served. Free, donations appreciated. ​Women have spent countless hours cooking, cleaning, tending fires, and caring for children. They also created beautiful yet useful household items such as hand woven rugs, colorful quilts, embroidered tablecloths, as well as lace camisoles and clothing for their families. This exhibit looks at specific women in our community from the past and present, both housewives and servants, telling their tales in their own words. It explores the daily lives of a pioneer in the mid-1800s, a Victorian in Marquette in the 1880s, a farmer's wife during the Depression and more. Artifacts on display will include a variety of household appliances and tools as well as elegant and everyday handwork from the 1850s to the 1970s. Opening reception: February 6, 5:00 pm - 7:00 pm, light refreshments will be served. Free, donations appreciated. 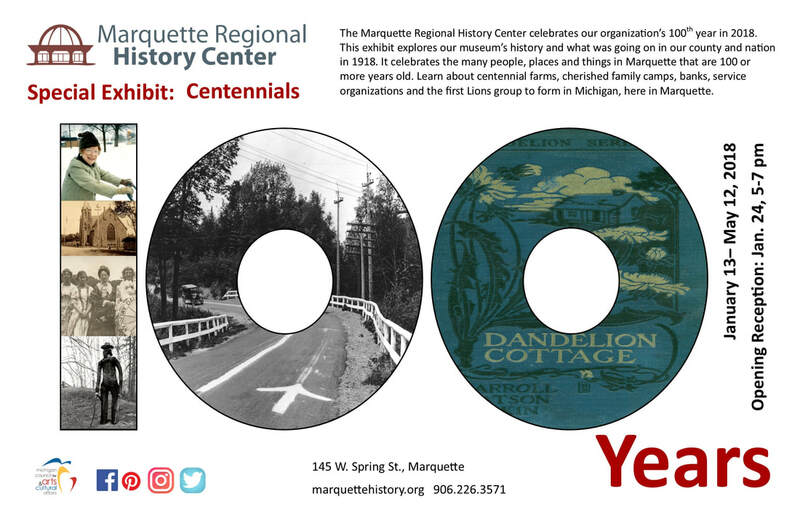 The Marquette Regional History Center celebrates our organization's 100th year in 2018. This exhibit explores our museum's history and what was going on in our county and nation in 1918. It celebrates the many businesses, people and organizations that are 100 or more years old. From centennial farms, cherished family camps, banks, service organizations and more! Learn about the first Lions group to form in Michigan in 1919. Opening Reception: January 24, 5:00pm - 7:00pm, light refreshments will be served. Free, donations appreciated. As part of the History Center's 100th Anniversary, explore 100 artifacts from our permanent collection--from an historic birch bark canoe model to a vintage hat or two, to a beautiful music box. We collect the whimsical, mundane, archaic and awe inspiring. Learn more about the permanent collection and some of the amazing donations we have received over the years. Opening Reception: May 30, 5:00pm - 7:00pm, light refreshments will be served. Free, donations appreciated. See the evolution in the region's medicine from the time of patent medicines, home visits and the growing understanding of germs, to the St. Luke's School of Nursing and beyond. Hear first-hand accounts from the people who have cared for this community's health. Learn about the battles against epidemics, tuberculosis, polio and an early case of kidney disease in which the community rallied to provide the financial support for the necessary yet expensive dialysis. Opening Reception: September 19, 5:00pm - 7:00pm, light refreshments will be served. Free, donations appreciated. The most important event of the 20th century, the Great War continues to shape our world one hundred years after the US entry. Learn of the events leading up to the war, as well as the legacy left in its wake. Explore the impact of the 32nd Division, whom the French named Les Terribles. Read firsthand accounts of local soldiers and sailors, and discover the role of the local Red Cross and life on the home front during the war. As part of the community wide remembrance, see posters, and Facebook for other exhibits and events. There is magic involved in fly fishing. See how this sport captures art, philosophy, literature and environmental concerns. From handmade rods and flies, to the work of John Voelker, fly fishing has a rich history in this region. There will be numerous special events relating to this exhibition. Celebrating nine girls from across Michigan including a wrestler, an activist and a soldier who did great things before they turned twenty. Upper Peninsula girls Nancy Harkness Love, Copper Country aviator during World War II, and Jane Johnston Schoolcraft, Ojibwe creative writer and translator, are featured. This traveling exhibit was created by the Michigan Women's Hall of Fame. Sponsored by Zonta Club of Marquette. Logging was a large and powerful industry that shaped the landscape of our backyards and forests. Michigan law required logs to be marked on both ends to reduce the theft of timber. Rod Smith, education coordinator with the Michigan DNR, collected many of these log marks. Study these logs from around the Upper Peninsula and learn about the logging companies they represent. Sponsored in part by the Rod Smith Family. See the wonderful toy collection from the History Center - from colorful tin toys, quirky mechanical toys to beloved dolls and stuffed animals. Explore toys and games from the Victorian Era to the late 20th century and see how they have changed or remained the same. Folk artists have a long history in Upper Michigan. Many works stem from ethnic traditions, while other pieces were created to celebrate the lifestyle of the rural north woods. This exhibit highlights pieces from other museums, artists, and from our own permanent collection. Private collectors around the region acquire strange and wonderful items from autographs to vintage flashlights. These fascinating works give us insight into our culture. Come see some of the highlights. A small part of a telephone collection displayed in our 2014 Ma Bell exhibit. Discover the origins of our wedding traditions and view beautiful and unique gowns and their stories from the Center's extensive collection. Many of our traditions date back only 100-150 years. Glimpse local brides in period gowns and some unique dresses made from unusual materials such as a gown made from a WWII parachute. Open during regular museum hours. Included with general admission. Suzan Pitt is an internationally acclaimed painter and filmmaker who has lived and painted here every summer for the past 16 years. These works are not landscape "pictures" but are the artist's interpretation of the inner being of the forest---not only as it "appears" --but as it breathes and moves and emanates its natural being. Suzan Pitt's work is known for its surreal and psychological visual explorations which emanate and express the underlayment of place. Pitt has created a 17' mural panorama of the primeval forest especially for this exhibition and will present this among watercolors and acrylic paintings of the plants and trees of the Upper Peninsula in Marquette County. Meet the artist, gallery talk at 7:00 pm. Refreshments provided. Free to MRHC members; suggested $5 donation to non-members. Be sure to attend some of the Woodland Offshoots summer long programming in conjunction with this exhibit. Printable brochure below. Henry Ford in the U.P. Once the largest private landowner in the U.P., Ford wanted to control all aspects and resources involved in automobile manufacturing. His passion drove him to buy extensive timber lands and to operate mines and lumber mills from Kingsford to Big Bay. View artifacts and photographs gathered from museums and private collections from around the state for a rare look at Ford's impact north of the bridge. As Ford Corporate Historian and Creative Manager, Bob Kreipke has produced many award winning films and authored three books on Henry Ford and the Ford Motor Company. Free to members, $5 suggested donation for the general public. 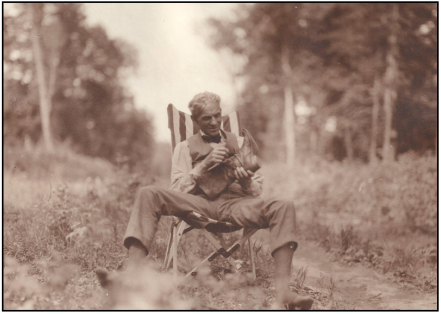 Henry Ford, ca 1923, on one of his camping trips. He camped with Thomas Edison, Harvey Firestone and naturalist John Burroughs in a group they nicknamed The Vagabonds. These grand excursions were made to the Upper Peninsula and other regions of the country. Since Alexander Graham Bell’s first words “Mr. Watson—come here—I want to see you,” telephone use has exploded into new dimensions. Explore how this telephone has influenced our lives for over 130 years. See a local switchboard, antique and unique phones. Wealthy Victorians have been lured to Michigan’s Upper Peninsula seeking a healthy paradise. Visitors and residents have sought both the simple pleasures, like a campfire, as well as adventurous activities, like ski jumping. Re-live the places, past times and the kitsch souvenirs of the UP. See how the Queen’s long and powerful reign influenced social life in the UP in the mid to late 1800s. The growth of technology and the middle class changed the role of women in the home bringing new domestic arts and a development of women’s hand crafts. Sentimental and ornate homes and clothing were the style, as was a strong mourning culture. See local hair wreaths made in honor of passing pets and family members.